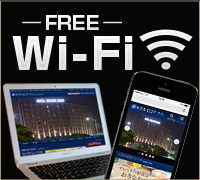 All guest rooms in Rocore Naha are equipped with free wireless internet. Use your smartphone, tablet, computers, and other devices on the internet just as you would at home. 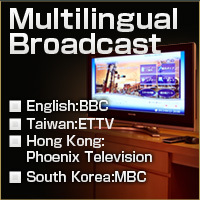 - All Guest Rooms (Wired / Wireless) *A LAN cable (1m) can be found in each room. All rooms include high-speed LAN (ethernet) fiber-optic broadband connections. - Some areas may have weak or no signal from the wireless router, which may make the internet unavailable in these locations depending on the current signal conditions. - We ask that all guests making use of the internet please be responsible for their own individual security settings. Copyright(C) HOTEL ROCORE NAHA. All rights reserved.